← “Non Possumus,” No, Unfortunately, We Cannot. Old trucks, old junk, old men sifting through the detritus of their past. 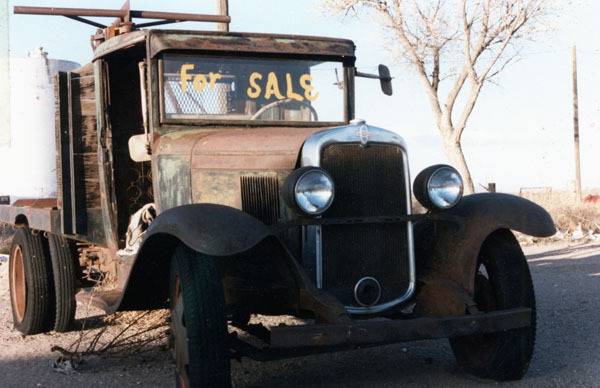 I found this photo of a Chevy truck for sale, seems to me that it might have been taken in either Deming or Lordsburg, New Mexico, probably sometime around 1978 or 1979. I didn’t ask how much the owner wanted, don’t know what I’d have done with the thing if I had bought it. From the looks–this is merely a guess–the vehicle must have been created sometime in the early 1930’s and likely was used to transport some sort of drilling rig. Regardless of its age, appearance, and usefulness (or lack thereof), I looked, admired, photographed. That’s what I’ve done with rusty, cobwebby, derelict objects ever since I was a kid growing up out here in the west. Why was the west important for such objects? Well, it’s dry. Metal doesn’t oxidize as quickly as would be the case along the beach in Florida (though the heat and lack of humidity is hell on wood). Cars and trucks that were abandoned in the field remained where they’d been left, often becoming home to rats, mice, snakes who ate the rats and mice and a variety of insects that lived on the leftover parts of the rats, mice and other stuff inside the old vehicles. I learned early on to examine the remains from outside. Opening doors, trunk lids or even trying to lift the hood might result in an unpleasant surprise. One of my joys as a young man was to visit air fields that had been abandoned following WWII. My father was a military pilot and he told stories of the derelict objects that remained in and around the cavernous hangars at the old fields, most of which were far enough from what passed for civilization that they weren’t desirable real estate. That would come later…as would the chain link fences that the federal jackboots demand be erected around air fields no matter how undesirable the location or how unlikely it would be that a terrorist would covet that Cessna 140 with the jack-knifed wing from a ground loop or the ratty Bellanca that’s been out of annual for three decades. I have other photos of rusty cars, trucks forgotten by their owners, airplanes left to the elements that I’ll be sharing…some of them accompanied by stories…all with comments that probably are as irrelevant as the objects themselves.